Scotland centre Mark Bennett will move from Glasgow Warriors to Edinburgh on a three-year deal this summer. Bennett joined Glasgow from Clermont Auvergne in 2012 and made his international debut two years later. The 24-year-old will follow Duncan Weir in moving east from the Warriors, the Scotland fly-half having joined Edinburgh last year. Meanwhile, Glasgow have announced that forwards Josh Strauss and Gordon Reid will also leave this summer. 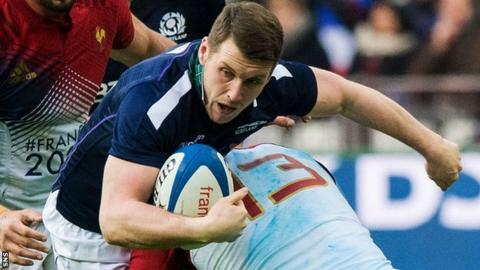 South Africa-born back-row Strauss and prop Reid joined Bennett in the Scotland squad for Sunday's 22-16 defeat by France, with Strauss starting. "A key factor in my decision was that there's a young squad at Edinburgh, who are going in the right direction and I can feel like I can add to that," Bennett told Edinburgh's website. "At 24 I think I could be one of the older boys in the Edinburgh backline, which would be a new experience for me, but one that I'm looking forward to next season. Acting head coach Duncan Hodge added: "He's a phenomenal player. "Having worked with Mark over a number of years, I know he is ambitious and motivated to develop his own game as well as providing leadership to those around him." Reid turned professional with Glasgow and has made over 100 appearances for the club. Strauss joined the Warriors from Super Rugby side Lions in 2012 and after three years residency qualified to play for Scotland in time for the 2015 World Cup. "Although there is a lot of rugby still to be played this season, I'd like to acknowledge and thank Gordy, Josh and Mark's invaluable contributions since they joined the club," head coach Gregor Townsend told the Glasgow website. "We look forward to them ending their time at the Warriors with the same commitment and skill they have shown already this season and wish them well in the next stages of their careers." Seven goals, last-minute VAR drama - was Man City v Spurs one of the greatest games ever? Read more on Seven goals, last-minute VAR drama - was Man City v Spurs one of the greatest games ever? This week's sport on the BBC includes the Premier League, Masters golf, Indian Premier League and County Championship cricket, plus much more. The epic journey of Mo Salah! From Egypt to Liverpool, follow the story of a football superstar.